Why does anyone still listen to Nate Silver? 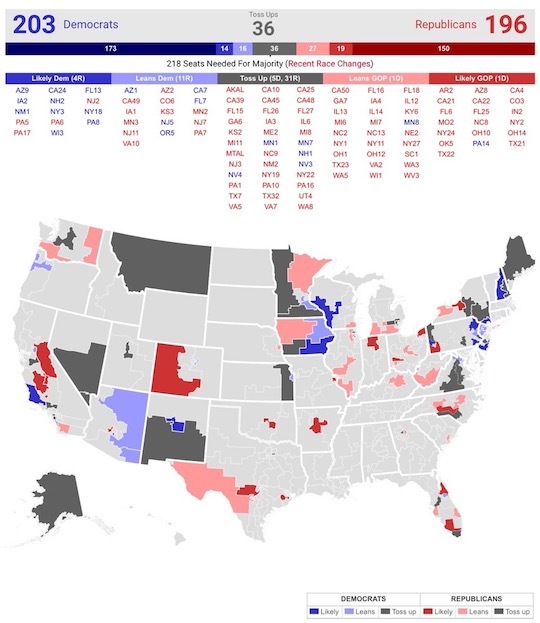 “This will be an extremely close election for control of the House,” says our Jim Rickards. Whelp, time to dirty our hands with politics here. For the most part, we’ve managed to keep The 5a blessedly “midterm-free zone” this fall. Yes, we’ve been all over the cannabis referenda in four states… but we’ve tuned out the partisan food fight surrounding the Congressional contests. Today, however, on the eve of Election Day, we grit our teeth and tighten the stomach muscles… because there’s a timely trading opportunity tied to this election. A casual glance at the mainstream headlines tells you it’s all over: The Republicans will likely hold onto the Senate, but the Democrats are a lead-pipe cinch to take the House. Yes, there’s a trade he suggests on the back of that prediction. And the best part is, he could be wrong and you still stand to make money. “Right now, the Democrats have a slight edge but Republicans have better momentum,”says Jim. “Of the 435 seats up for grabs, 399 seats (203 Democrats and 196 Republicans) are considered safe for the incumbent party or lean in favor of the incumbent. That leaves only 36 seats that are too close to call. So there you have it: “The Democrats have to win 10 of 31 toss-up races for seats now held by Republicans to win the House. Speaking of polling… be careful how you read the figures. “Only polls with likely voters should be given much weight. Even then, the likely category may be derived from a baseline of past elections, such as 2012, that may not be indicative of how likely voters will vote now. “Pollsters also tend to overweight Democrats relative to Republicans and to overweight African-Americans within the Democrat sample. Pollsters do a poor job of getting through to people who use cellphones and they cannot properly estimate the actions of those who won’t answer the phones at all. Many voters do not give truthful answers to pollsters; they may have a view but are reluctant or embarrassed to state it to a stranger. Aside from that, polls are dead-on balls accurate! We anticipate an objection, especially if you’re a newer reader: What about Nate Silver? As we write on Saturday afternoon, Nate Silver says Democrats stand an 85.4% chance of winning the House. Even if you’re not a political junkie, chances are you’ve heard of Silver. He burst onto the scene in 2008 with his FiveThirtyEight website. He correctly forecast Barack Obama would edge Hillary Clinton for the Democrats’ nomination. In the general election between Obama and John McCain, he correctly called the winner in 49 states. In the 2012 Obama-Romney race, he improved on that performance — calling all 50 states correctly. Along the way, Silver built up a faux-science mystique around his work in a book called The Signal and the Noise: Why So Many Predictions Fail — but Some Don’t. Then along came Trump… and Silver should have demanded more of himself. Six months later, Trump had the nomination sewn up… and Silver was forced to engage in a bit of introspection. On Election Eve 2016, Silver grudgingly gave Trump a 30% chance of pulling out a victory. He said “turnout and late-deciding voters” would tell the tale — which, if you think about it, is something you or I or anyone else could have said without benefit of “predictive analytics” — heh. “The decisive question is whether the Republican momentum continues and can close the gap in time or whether the Democrats can hang onto their edge and take the House. “The economy may tip the election in favor of the Republicans. We’ve just had two back-to-back quarters of strong growth. Unemployment is at a near 50-year low and stocks are near an all-time high despite recent drawdowns. The outcome of the race for control of the House is serving up what might be the safest and most lucrative “asymmetric trade” that Jim has identified to date. The classic instance was Jim’s call on the “Brexit” referendum in June 2016. Conventional wisdom said a majority of Britons would vote to remain the European Union. Conventional wisdom was upended when a majority voted to leave. Jim anticipated the distinct possibility the “leave” side would achieve an upset victory. So he encouraged readers to lay on a trade that would win big if “leave” prevailed… but would register only a small loss if “remain” won as expected. In the event, “leave” pulled off the upset… and depending on how they played it, Jim’s readers bagged a 129% gain in three days. By the time the U.S. presidential election rolled around a few months later, Jim was willing to venture that Trump would pull out a victory — against all the conventional wisdom, you’ll recall. And Jim was right. Alas — and in the interest of full disclosure — the timing of the trade was off the mark. Global markets sold off hard, as Jim anticipated… but only for a few hours overnight. By the time U.S. markets opened for business the next day, the opportunity had already passed by. Looking at the 2018 midterm version of the asymmetric trade… it’s about as low-risk as your editor can imagine. Without giving away too many details — those are reserved for paying subscribers, after all— I can tell you the risk-reward proposition here is extremely attractive. If Jim is right and the Republicans manage to keep control of the House, this trade stands to pay off huge. But even if he’s wrong and the Democrats win the House, this trade still stands to pay off — simply because of the way Washington works. Maybe it won’t pay off as big… but then again, knowing how D.C. operates, it might. No, it’s not a “sure thing.” No trade ever is. What’s more, the payoff might unfold gradually — over the next six months. But for the opportunity to make 16 times your money — and that’s the profit potential with this trade — you could probably exercise that patience, no? Then again, Jim says the gains could materialize within only hours — with a $1,000 stake transformed into as much as $16,330. Still not convinced? Jim makes his strongest case when you follow this link. Just make sure you do so right away. If events materialize with the speed he thinks they might… you need to place the trade no later than tomorrow. For that reason, this link comes down at midnight tonight. Thanks for your attention to this atypical episode of The 5. We’re back tomorrow, again on the earlier side, with a last-minute assessment of the cannabis referenda in four key states and the implications for fast-moving penny pot stocks. P.S. Twice now, Jim Rickards has made mincemeat of mainstream political predictions. First he said “Brexit” had a chance in Great Britain… and Brexit won the day. Then he said Trump would pull out a victory… and Trump did. Now Jim is ready to show up the mainstream again with a bold midterm election forecast. …but only if they take the right steps by tomorrow morning.